* The biggest mechanical change is the movement of the front derailleur. 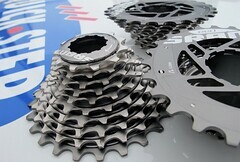 The angular sweep of SRAM’s Yaw design is a big improvement from first-generation Red. Is it in the same ballpark as Dura Ace Di2? Sadly, it’s not. The tiptronic-like way Di2 commands your chainrings is dramatically superior to the clutch-popping clatter of mechanical shifting. I realize this is less a comment on Red than an observation about the wonders of electronic shifting. Nevertheless, the new Red is a substantial improvement, and remains (as I explain below) a drivetrain worthy of serious consideration. * The new Red has the best braking I’ve ever felt. It has a light touch, light action and great modulation. This is a huge difference compared to Shimano and Campy, as well as first generation Red. I attribute this to the vastly improved cables (this is not good for our aftermarket Yokozuna sales) as well as the new lever shape. * The adjustability of the Doubletap levers is a big deal. The proliferation of custom frame building and fit studios in the last several years is proof of the market viability of excruciatingly individualized bike fit. The new Red Doubletap levers encourage this sort of personalization. * When you’re cruising down the road, the new Red is significantly quieter than the first generation. SRAM’s noise reduction efforts, particularly in the cassette and rear derailleur, work. But make no mistake, rear shifting is still super-loud because of the clacking sound in the right Doubletap lever, which is the trade off for such quick rear shifts. * The lightness of the new Red is its main line of defense in the marketplace against Shimano’s electronic shifting. It’s 545g lighter than the current generation Dura Ace Di2 and 864g lighter than Ultegra Di2. (This includes all on-the-bike hardware required to mount Di2.) If you’re building a BB30 bike, the weight differences are even more dramatic. So which should you build your bike with, Red or Di2? There’s no questioning that Dura Ace Di2 offers superior shifting. But on an otherwise equivalent bike, Dura Ace Di2 will cost an extra $2,000 and weigh an additional 1.25lbs. If money is no object, you’re probably saving plenty of weight elsewhere already, so Dura Ace Di2 is the better option. But if money is a significant consideration, then the better comparison is between Red and Ultegra Di2, since they’re both about the same price. Ultegra is less sleek than Dura Ace Di2. And, as mentioned above, it adds about the weight of an entire second frame to your bike. In factoring in price, performance, and aesthetics, our recommendation is Red. The superior shifting Di2 can’t outweigh Ultegra’s shortcomings. * Finally, there has been a lack of clear information about compatibility specifics between first and second generation Red components. If you plan on upgrading in a piecemeal fashion, it’s crucial that you install the second generation front derailleur, shifters, and crankset all at the same time due to the unique rotation of the Yaw front derailleur. You can pretty much assume that the Yaw front derailleur won’t work with any other crankset out there. Because the the Yaw front derailleur is an all-new design for SRAM, before building a bike with the new Red, be sure to watch this video beforehand to understand the all-new set up. As for the rest, the first generation Red rear derailleur, cassette, chain, and brakes are compatible with second generation Red shifters, and vice-versa. Paris-Nice runs at the same time as Tirreno. And while their overall length is similar, does anyone else find Paris-Nice seems almost dainty compared with the relentless brutality of Tirreno? First, as already identified by the blog Cyclismas, was the daily spectacle of Bradley Wiggins cooling down on a trainer after each stage of Paris-Nice. It’s a move straight out of American weekend stage racing. We amateurs lack in PRO recovery tools like massage and Space Legs. So a 20-minute cool down on the trainer between stages makes sense for us since we usually face a road stage in the morning and a TT in the afternoon. But should a pro do the same? Yes, Wiggins’ dominance of the race speaks for itself. But post-stage turbo training decidedly lacks the drama of other post finish line rituals. Is this a self-fulfilling prophecy? After all, Milan-San Remo is Italy’s most prestigious one day race and the Italians dream all winter about winning it. Just as you’d expect the winner of the Cholet-Pays de la Loire to be French, and to come from the Paris-Nice peloton, you’d reasonably expect the winner of Milan-San Remo to be an Italian from the Tirreno peloton. But, interestingly, that’s not how things play out. 10 of the previous 14 editions of Milan-San Remo were won by non-Italians. Non-Italians have a choice on how to spend the first week of March, and they choose Tirreno. – It’s probable that Wiggins’ trainer usage goes back to his years when he focused on the track. Given the obsession of many British pros with the upcoming London Olympics, there’s likely a connection there. Did you know that the new velodrome being built for the Games has the nickname ‘The Pringle’, after the potato chip? And did you know that it purportedly suffers from a lack of loos? 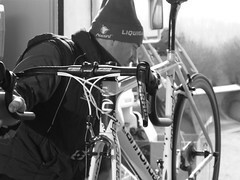 – While Wiggins’ use of the trainer confused me, the trainer use shown below awes me. Each of us must prep for our own Spring Classics in our own way. – If your prep for the race season includes time in the weight room, apparently you should not brag about your leg press. – Sponsoring a pro team has its advantages. The main one is that you get hooked up with swag better than just T-shirts. Thanks to Skullcandy for the hook up. When we rock out, we’ll be correctly kitted out.